Google's new Flight Search allows users to find and book travel. NEW YORK (CNNMoney) -- Google launched a new flight search service on Tuesday, putting it in direct competition with travel search players including Orbitz and Kayak. Starting Tuesday, when a user searches for flight information -- like "flights from New York to Chicago" -- a "Flights" link will appear on the left side of Google's search page. Google Flight Search can also be accessed directly at google.com/flights. From there, Google (GOOG, Fortune 500) displays a shortlist of flights based on cost and total travel time, including various departure times and airlines. Filters are set for "reasonable" price and duration, but users can manipulate them to show more flights. One unique feature is an open-ended destination: Users can click the Flight Search map and use filters to see where they can go within certain time and cash boundaries. For example, a San Francisco flyer can check where he can visit within 3 hours for less than $300. 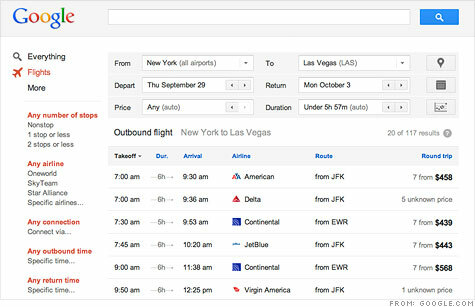 The selection of flights shown is not influenced by any paid relationships with the airlines, Google said. Flight Search is currently limited to round-trip economy-class flights between certain U.S. cities, but it will be expanded in the future. Flight Search is the first product of Google's controversial $700 million purchase of ITA, the world's largest airline search software company. ITA data is used on websites including Kayak, Orbitz, Expedia.com, TripAdvisor and Microsoft's (MSFT, Fortune 500) Bing, as well as a number of airlines' websites. After Google announced its intent to buy ITA in July 2010, travel search players raised concerns about search behemoth Google having unfettered access to valuable flight data. Reuters said that Kayak, with backing from Expedia.com, offered to buy ITA to prevent Google from purchasing it. In April, the Department of Justice said Google could buy ITA only if the search giant accepted certain restrictions to avoid a monopoly. Even with the caveats, Google's entry into the travel search space is a blow to rivals. For example, Bing has advertised flight information as a key point of differentiation between it and Google. On Bing, users can enter domestic flight queries, and the engine will predict when it is best for users to buy a ticket. Beyond the big players, newbies in the field are surely taking note -- startups like Hipmunk, which is focused solely on simplifying flight search, are now contending with a huge name.